A replica of a Wild West treasure! Looks and feels just like the famous "Gun that won the West," but saves you BIG on ammo! 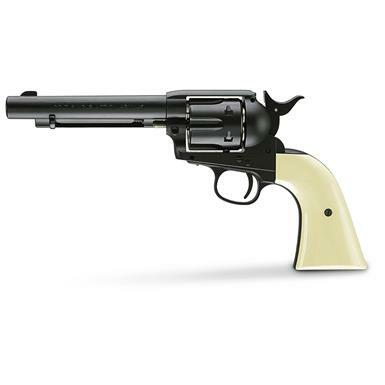 You'll feel like a real cowboy packing this authentic-looking Revolver! The Colt Single Action Army®, also known as the Peacemaker, was preferred by Wild West gunslingers, cowboys and lawmen. Now you can own this faithful replica that shoots inexpensive BBs for a lot less than the real deal!